I’ve been diving for quite a few years now and have been eyeing this dive off for most of that time, but always seem to be busy or find it already booked out when I try. Well this time I was lucky enough to get on! What better way to end a 4-day long weekend. Magic Point is located off the south of Maroubra beach in Sydney. You can get on a boat dive with some of the major dive operators in Sydney leaving from Manly, Rose Bay or as we did, the beach at Long Bay. I’ve been doing most of my Sydney diving with Abyss(.com.au) for the last few years. They always have great crew and today we had Klaus as our DM with 6 of us along for the dive. We tag teamed with another group who had done their first dive before us, then we did our first dive while they had a surface interval. When we returned, they went for their second dive while we stopped for our SI, before it was our turn for the second dive. From the beach landing at Long Bay, it’s a 5-10 minute boat trip around some of the iconic Sydney cliffs. We’re able to pull up to a buoy attached to the anchor dropped on the first dive and a few minutes later we’re in the water. 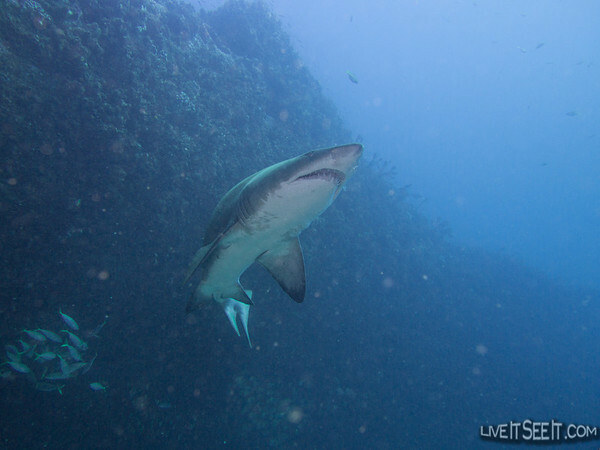 We descend to about 12m along the anchor line and take a short 10m dive along rock face and we are at the shark cave. 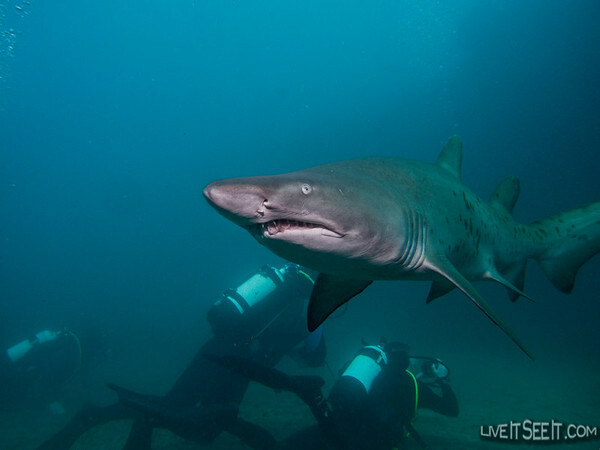 A few key rules to stick by such as not blocking or getting too close to the cave entrance and not trying to follow the sharks have been explained before the dive. Our group is a calm, switched on bunch and we’re spread around the cave about 5m out and settled on the sea floor calmly. Almost immediately one shark does a weird acrobatic move and I wonder what else we’ll be treated to. After later surfacing the DM is as amused as I am. As we sit and watch about half a dozen sharks move around calmly it’s quite amazing how comfortable I feel. The sharks are quite majestic with the larger, older sharks keeping a greater distance and the smaller, younger sharks more inquisitive. 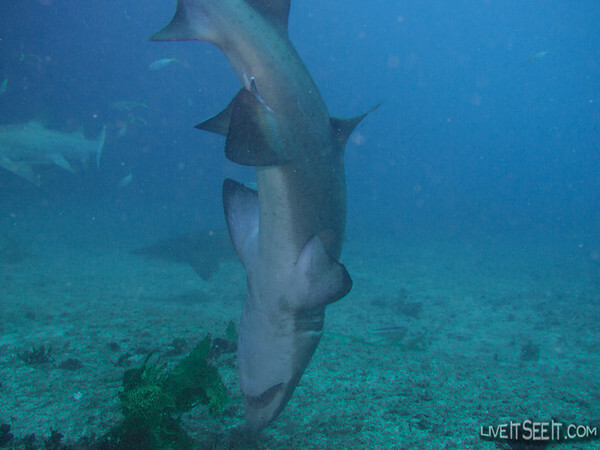 It’s on 2 of these younger sharks that we can see large fishing hooks, a disappointing sight for all of us. Unfortunately I don’t think they’d understand if we tried to help by removing them. At times the sharks are close enough for us to reach out and touch, but we stay still and let them be – wanting to impose on them in the least way possible. 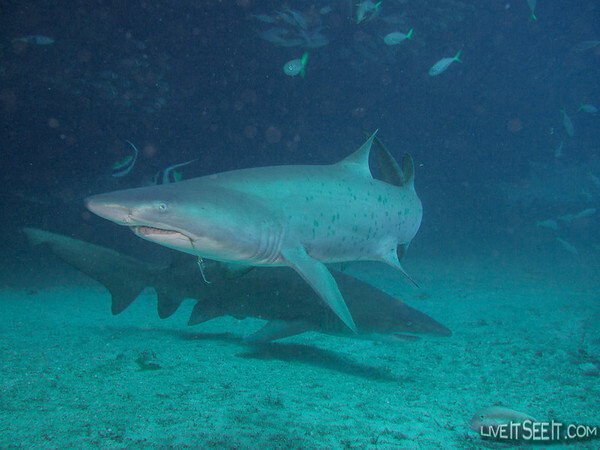 I focus on trying to get the best shots I can with my new underwater strobe (the term for an underwater flash unit). Our first dive is quite long, with our whole group conservative with their air consumption and after a short dive around the area we ascend after 50 minutes. We return to the beach for a surface interval and the traditional Abyss snacks including tomato soup with Tabasco sauce and peanut butter rolls. A second dive follows, much the same as the first although visibility is a little poorer with particles stirred up. Another 45 minute dive and we are done for the day. 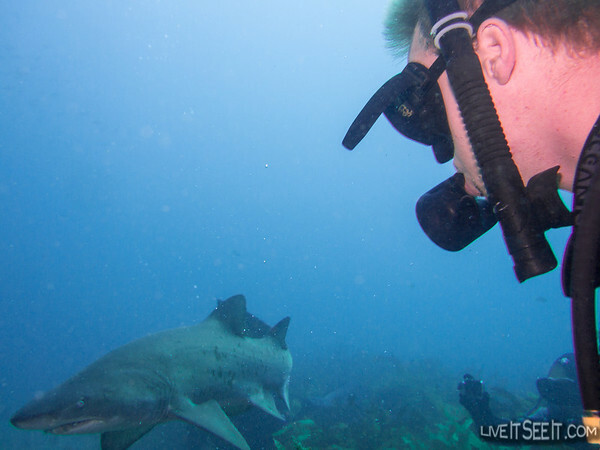 This would have to be the best combination of easy diving and amazing scenes that I’ve done. I’d definitely recommend it to anyone who has any interest in these majestic creatures, even if you’re a little nervous.